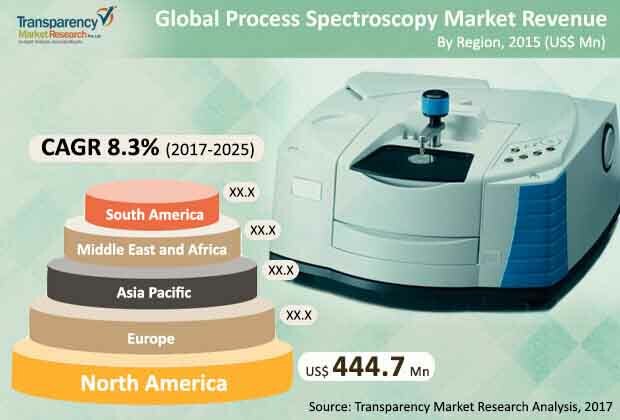 The global process spectroscopy market comprises large as well as mid-level vendors, including BUCHI Labortechnik AG, Shimadzu Corporation, Thermo Fisher Scientific Inc., and ABB Ltd, states Transparency Market Research. These companies have been able to establish strong presence globally. The vendors of process spectroscopy market are currently emphasizing on new product and technology development to meet various demands of its customer base and to continuously improve the quality and reliability of its products. Moreover, the vendors are adopting strategic acquisitions strategy to proficiently compete in the regional market. According to the research report, the global process spectroscopy market is expected to be worth US$2,005.5 mn by the end of 2025. During the forecast years of 2017 and 2025, the global market is expected to rise at a CAGR of 8.3%. In terms of technology, the Raman spectroscopy segment is projected to acquire a market share of about 20.6% by the end of 2025 due to its non-destructive nature. Regionally, North America is expected to dominate the overall market due to early adoption of technology. As of 2016, this regional market held a share of 48.3% in the overall market. The report states that the demand for process spectroscopy is expected to be on the rise as the food and agriculture sectors show tremendous growth. The growing awareness amongst consumers about quality and rules and regulation governing the same has triggered a significant uptake of process spectroscopy technology. The booming pharmaceutical industry has also had a similar positive impact on the global market. The microscopic study of matter through process spectroscopy has allowed several end-use industries to gather valuable information about properties of various types of matter. This process includes usage of spectroscopy to collect real-time information about manufacturing process. The information is primarily gathered to improve the manufacturing processes. Analysts believe that the escalating demand for manufacturing new and improved drugs is also expected to increase the uptake of process spectroscopy. Furthermore, the chemicals industry is projected to show a keen interest in this technology as its appropriate usage can safeguard humans from exposure to dangerous chemicals. Process spectroscopy is considered to be an important tool for management of chemical risks. Furthermore, the demand for next-generation cloud-based spectroscopy is also expected to show excellent momentum in the near future as it offers a good chance of optimizing resources of varying workload. The report also highlights that rapid technological advancements, development of products that match international quality standards, and growing need amongst players to save time in various process are likely to augment the demand for process spectroscopy technology in the forthcoming years. On the other hand, the global process spectroscopy market is being hampered by the high capital investment that is required for using spectroscopic equipment. Cost-sensitive markets, especially in the developing parts of the world, are expected to be the key restraint for the overall market. The market is also likely to be negatively affected by the slow rate of drug approvals. However, the stringent rules and regulations being imposed by various governments to develop effective remedies is expected to give the global market a much needed impetus. This review is based on Transparency Market Research’s report, titled “Process Spectroscopy Market (Technology – Near Infrared (NIR) Spectroscopy, Raman Spectroscopy, Fourier Transform Infrared (FT-IR) Spectroscopy, and Others; End-use Industry - Polymer, Oil and Gas, Pharmaceutical, Food and Agriculture, Chemical, Others) – Global Industry Analysis, Size, Share, Growth, Trends and Forecast, 2017 – 2025”.